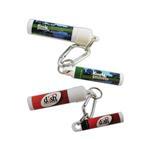 This sunscreen lotion, lip balm combo is the perfect size for the on the go person and great for promotional giveaways. Comes with a custom full color label. 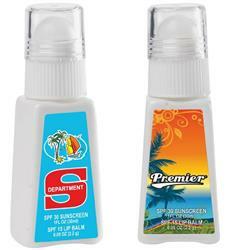 This item combines one ounce of SPF 30 suntan lotion with SPF 15 lip balm (in seperate compartment). It meets FDA requirements and includes all appropriate contents information. 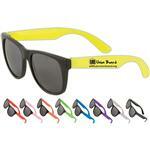 Also available: your choice of a goofy head with attached key clip - Inquire. RUSH ORDERS ARE AVAILABLE! Production Times Available: 7 to 10 working day production.